Rick McCollum may no longer be part of the Afghan Whigs, but singer-songwriter Greg Dulli still managed to pull off the improbable. 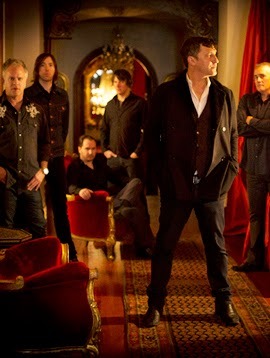 With a little help from Dave Rosser, Jon Skibic and Mark McGuire on guitars, Dulli and bassist John Curley made the first Afghan Whigs album since 1998. The album was largely unexpected only because Dulli does fine with his abundance of side projects, most notably The Twilight Singers, which he has manned with a rotating stable of musicians like Mark Lanegan, Ani DiFranco, and Nick McCabe. But like many reunited lineups it seems, the Afghan Whigs couldn't confine themselves to a handful of shows in 2012. They kept playing. In fact, it was during a post-show dinner that Dulli and Curley discussed the possibility of making another record. They started working on it two months later. They wrapped it all in December. Do To The Beast breaks a different Afghan Whigs. News of the album might not have made it out so far in advance, but Bob Odenkirk broke the story on Twitter as soon as he found out about it. Dulli was playing golf with Odenkirk and his long-time friend Mike Brillstein, who mentioned mixing a track for the album. That's all it took. Dulli had asked him not to tell anyone, but the deed was done. As soon as the label learned the news, Sub Pop Records stepped up on the first video in support the album, Algiers. The video, of course, is an homage to High Plains Drifter. The idea of a spaghetti Western came to him almost immediately after he finished the track. The video matches the song's sense of melodrama. Among the tracks, Algiers probably comes closest to sounding like a close cousin to The Twilight Singers. Most of the other tracks do not, building largely on where the Afghan Whigs left off years ago. The Afghan Whigs are a rock band whereas The Twilight Singers were created in response to the Afghan Whigs. Do To The Beast is almost a response to The Twilight Singers, full circle. The opener Parked Outside is one of the hardest rocking songs ever recorded by the Afghan Whigs. It is propelled by a driving riff that clearly casts the album as less of a homecoming and more as of a evolution. Dulli proves that he is open to making this a restart with some equally savage moments. But that is not to say he isn't open to other ideas. The wildly composed disco-infused and oddly sinister nomadic undertones capture his inventive nature on Matamoros. Listen to the track a few times because it is easy to dislike it on the first pass but relish it by the third. More palatable on an immediate uptake is It Kills. The standout moment in the song, of course, is in the Huff-style orchestration with Van Hunt lending a howl to the song after Dulli asked him to do anything he wanted but without words. The howl isn't lost in the diversity of the album. Lost In the Woods is a haunting centerpiece. The Lottery returns to the band's rock-centric roots. Can Rova comes across like an atmospheric dream. Royal Cream and I Am Fire also lend something to vital to the album when played in entirety. Along with Curley, multi-instrumentalist Rick Nelson, and the guitarists mentioned earlier, Cully Symington delivers some standout moments on drums. There are also several dozen cameos too, everyone from Dave Catching and Patrick Keeler to Ben Daughtrey and Alain Johannes. Do To The Beast By The Afghan Whigs Hits 8.1 On The Liquid Hip Richter Scale. Almost more than the Afghan Whigs, anyone who has an appreciation for Dulli will love this album. There are moments when all anyone can do is stare slack-jawed while taking in everything he manages to meld together. Do To the Beast by the Afghan Whigs is available on Amazon or you can download it from iTunes. The vinyl release of Do To The Beast by the Afghan Whigs can be found at Barnes & Noble. The full tour schedule of the timeless Cincinnati-based band can be found on Facebook.